In Style Eyes Amor Nearly No Line Bifocal Wayfarer Sunglasses Black 3.50 by In Style Eyes at Sunglasses Tokyo. Hurry! Limited time offer. Offer valid only while supplies last. These Bifocal Sunglasses give you a Great way to not have to Switch between Sunglasses and Reading Glasses while you're Outside doing what you Enjoy. These Bifocal Sunglasses give you a Great way to not have to Switch between Sunglasses and Reading Glasses while you're Outside doing what you Enjoy. 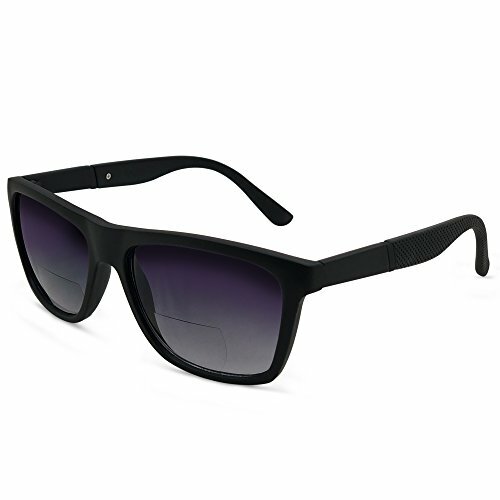 You will look Good wearing these Popular Retro Sunglass Bifocal Readers. UV 400 Protection Prescription Quality, Vision Correcting Lenses of your choice give you Total Vision Coverage. Now you can truly enjoy all of your favorite Outdoor activities without Carrying Two sets of Glasses! These Premium WayFarer BiFocal Sunglasses have gone through our Rigorous Quality Control Department. Includes Hard Case and Cleaning Cloth. Frame front width 5.75"; Lens height 1.9"; Temple length 5.75"; Bridge .75"